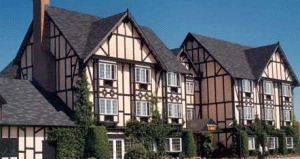 Make Yourself at home in our cozy, 30-room English Tudor-style hotel, conveniently located off Highway 17 in the countryside north of downtown Victoria. You'll appreciate the antique style furnishings and decor in each room, the old English atmosphere of our lobby and fireplace lounge, and the nice extras like free deluxe continental breakfast. We look forward to welcoming you to the Quality Inn Waddling Dog Victoria Hotel. Please visit Quality Inn-Waddling Dog Website.